Bryan Killman of E-Distribution is a material handling professional with 20+ years of experience in systems design with a specialty focus on conveyor system design integration. In this blog, Bryan shares some insight into one of the tools used in identifying and quantifying warehouse order processing for the purpose of finding efficiencies and nimbly reacting to changes in demand. The Order Profile is a supply chain tool used for several purposes. 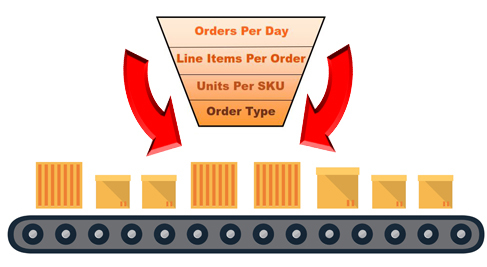 Basically, the order profile tells warehouse management the rate at which inventory moves through the facility each day, and the process or steps taken in the facility to fulfill each order. The order profile can get as granular as weight per piece or carton, daily volume fluxuations, shipment source and destination particulars. Regular review of the order profile can position your facility to be more adaptable to changes in fulfillment type, size, speed as well as customer expectation. Now, you may be wondering why we mentioned Bryan’s conveyor expertise at the onset of this blog? It is often the case that conveyors are one of the best cost-saving methods in an order processing system. Conveyors simply fulfillment by reducing worker and equipment travel, protecting inventory, batching orders, weighing, scanning and more. They don’t require overtime pay and can move at a safe, but fast speed. Bryan and the E-Distribution team want your facility to be as responsive to changing demand and fulfillment pressures as possible and since we know it is a lot of work to mine this type of data for warehousing efficiencies, we’d like to help. Contact Bryan for an Order Profile Review & Conveyor Consultation. He can help determine if your current systems are just what you need to handle your current fulfillment needs and any expected changes. If efficiencies can be found, he can make suggestions and offer a free estimate for updated warehousing systems and equipment whether conveyor, rack or otherwise. Call Bryan today to schedule a consultation and let’s see what it is your Order Profile is trying to tell you.